This article covers some of the SAS Statistical Business Analyst certification questions with detailed answers. This certification covers some of the most widely used statistical techniques such as ANOVA, linear and logistic regression. Which of the following two sampling methods are acceptable while splitting data into multiple samples - training, validation and test samples? Explanation : When we split our data into 3 parts - training, validation and test, we perform sampling without replacement. It means a row can be selected only one time which would either move to training, validation or test sample. In other words, same row can never be found in more than one sample. The opposite of this is sampling with replacement. Why not sampling with replacement? If we perform sampling with replacement, we would not be able to assess model performance correctly because same data points that were used to train model exists in validation or test datasets. The explanation of Stratified Sampling is provided in the next question. 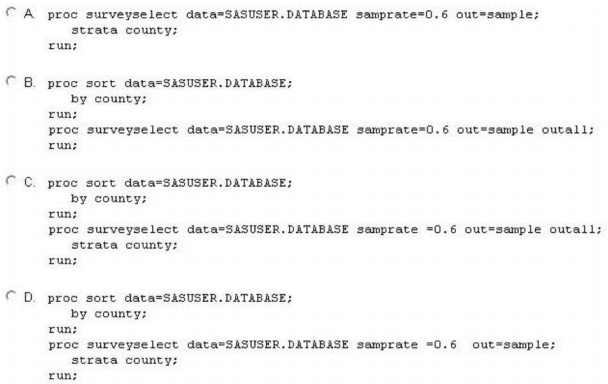 Explanation : It is required to sort the variable you want to use to stratify sample before running PROC SURVEYSELECT. Stratified Sampling helps to keep the initial ratio of events to non-events in both the training and validation data sets. It is important in the case of rare-event model. In this case, we are keeping initial ratio of country variable in both the training and validation sample. In order to perform honest assessment on a predictive model, which is an acceptable division between training, validation, and testing data? Explanation : There is no fixed optimal splitting rule. Some researchers use splitting rule - 70% training and 30% validation. Some use 60% training-20% validation -20% test. It is important to note that 20 to 50% of data should be used as a validation set in order to measure model performance. A marketing campaign will send brochures describing an expensive product to a set of customers. The cost for mailing and production per customer is $50. The company makes $500 revenue for each sale. What is the profit matrix for a typical person in the population? Explanation : It is 450 because $500 revenue was generated and $50 mailing cost was incurred when purchase was made and mail was sent. So, profit = 500 - 50 =450. Profit matrix is used to choose optimal predicted probability cutoff. It is more used rather than sensitivity or specificity to decide the cutoff. The optimal cutoff maximizes the total expected profit. A. It violates assumptions of the model. B. It requires extra computational effort and time. C. It omits the training (and test) data sets from the benefits of the cleansing methods. D. There is no ability to compare the effectiveness of different cleansing methods. Explanation : If we perform data cleaning before splitting data into training and validation datasets, we would not be able to compare models based on different imputations / transformations methods. As you move along the ROC curve, what changes? 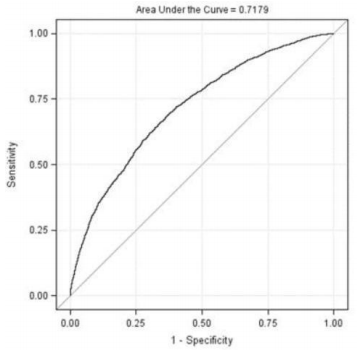 Explanation: As you move along the ROC curve, you get more true positive (Sensitivity) but also more false positive (1-Specificity). It also changes the probability cutoff for scoring as the idea is to maximize the difference between True Positive and False Positive. How multicollinearity can affect the regression model? Explanation : Multicollinearity implies high correlation between independent variables. High multicollinearity inflates standard error of parameter estimates and makes the interpretation of estimates incorrect. Which of the following is an assumption of ANOVA? A. No correlation between any one observation with another. D. High correlation between any one observation with another. Explanation : The most important assumption of ANOVA is independent observations. It implies the response value of one observation does not influence the response value of another. You have 50 observations in ANOVA and you calculate the residuals. What will they sum to? Explanation : The residuals always sum to 0 no matter the number of observations in your dataset. If you want to compare the average monthly salary of males and females, which of the following two statistical method should you choose? You can use one-way ANOVA and two-sample t-test because you are comparing two groups, males and females. You can use two-way ANOVA when you have more than one independent variable. What values are not affected by oversampling in a rare event model? Explanation : Oversampling does not affect sensitivity or specificity measures. It affects Intercept of a model. validation, and test sets to perform honest assessment during the model building process. What is the purpose of the test data set? A. To provide a unbiased measure of assessment for the final model. B. To compare models and select and fine-tune the final model. C. To reduce total sample size to make computations more efficient. D. To build the predictive models. Explanation : The test data set is used to assess model without any biaseness. the sensitivity and specificity statistics on a validation data set for a variety of cutoff values. Which statement and option combination will generate these statistics? Explanation: In PROC LOGISTIC, the OUTROC= option tells SAS to generate data for the ROC curve to the SAS data set named roc. 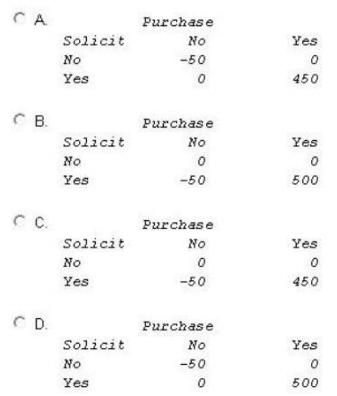 Assume a $10 cost for soliciting a non-responder and a $200 profit for soliciting a responder. The logistic regression model gives a probability score named P_R on a SAS data set called VALID. 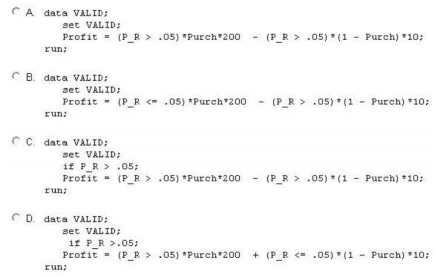 The VALID data set contains the responder variable Purch, a 1/0 variable coded as 1 for responder. Customers will be solicited when their probability score is more than 0.05. 16 Responses to "SAS Statistical Business Analyst Certification Questions and Answers"
These questions were very useful. Thank you. This is really helpful.I didn't find explanation anywhere.Thanks much buddy! Very informative. Really enjoyed it! Thank you! The following LOGISTIC procedure output analyzes the relationship between a binary response and an ordinal predictor variable, wrist_size Using reference cell coding, the analyst selects Large (L) as the reference level. What is the estimated log it for a person with large wrist size? You can use calculator if needed. NS Khan, the question is asking for the estimated logit for Large Wrist size, which (as noted) is the reference level. Reference level is the Intercept in the logistic procedure output. So we can find the intercept in the Parameter column, and find it's logit estimated value in the Estimate column; and we find that the answer is -1.0415. 2.) If you know in which output column to find the estimated logit.